Gold is up over $1,170 this morning which is actually down from last week’s high just above $1,180. The last few weeks have seen a surge in metal prices and buyers appear to be back in the market in a big way. Dealers have seen a marked increase in sales in the last month and the Teletypes are covered with more buy than sell messages as dealers are trying to fill the needs of their customers. Silver advanced over the $16 mark before backtracking to the current $15.85 level. Ninety percent Silver bags are currently trading at $12,950 among dealers and VG Silver Dollars are wholesaling at $25,950 per bag. Premiums are strong for the Proof Gold and Platinum one ounce coins in the original government packaging. Proof Gold $50 coins are trading at $1,400 and the $100 Platinum is at $1,245. 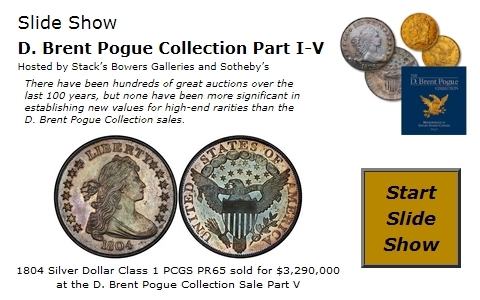 With so many important auctions having hit the market over the last year it would seem there would be little left to impress advanced collectors and dealers. However, the upcoming Eugene H. Gardner Collection Part IV, in conjunction with the Heritage Auctions New York Sale at the end of October, will be one that should not be missed. This portion of the Gardner Collection may have a concentration of his duplicates and upgrades but it is not without its fine selection of true rarities. The 1871 CC Seated Quarter and the 1873 CC with Arrows, both in PCGS AU55, are extremely difficult to locate in Mint State and nearly as rare in the AU grades. The 1871 CC also has the CAC approval and is the only coin available in AU55. This may well be the highest graded coin currently available as the two grading higher in MS65, one each PCGS and NGC, are in strong hands. The 1873 CC Seated Quarter with Arrows is just as rare with only two coins in PCGS AU55 listed. 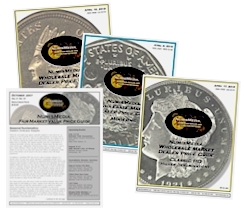 There are three coins in Mint State with one PCGS MS64 and one each PCGS and NGC in MS65. However, it is noted that the NGC coin is now in the PCGS holder and is the only MS65 known. Below is a list of a few of the fine rarities in this upcoming sale. 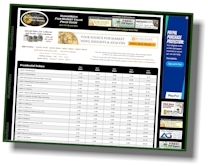 Many changes can be found throughout the LD Wholesale Dealer Price Guide this week with most of the adjustments slightly downward in the Indian Cent and Lincoln Cent charts. There is still demand but some of the buyers are looking for bargains in this market. There are some increasing prices in early Lincoln Cents as buyers are looking for specific dates and grades. The 1920 D in MS64 Red is up to $375 Market and the 1931 S Red in MS65 is now at $535.